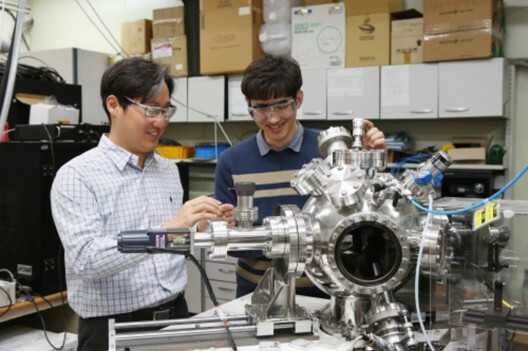 Professor Chan-Ho Yang and his team from the Department of Physics developed technology to create and remove topological defects in ferroelectric nanostructures. This technology will contribute to developing topological defect-based storage that will allow the saving of massive amounts of information in a stable manner. Topology refers to the property of matter upon deformation, in which a circle and a triangle are considered to be the same topologically. During the announcement of the 2016 Nobel Prize in Physics, the concept of topology was explained with a bagel with a hole, cinnamon bread without a hole, and a glass cup. Although the cinnamon bread and the glass cup have different appearances, they are topologically the same since neither has a hole. In the same sense, the bagel and the cinnamon bread are topologically different. In other words, topology of matter is conserved and its properties cannot be altered by continuous deformation. Using this topological texture can produce information storage devices that can protect the stored information from external stimuli, but the data can still be written and erased, resulting in ideal non-volatile memory. Unlike ferroelectrics, magnetic topological defect structures such as the ferromagnetic vortex and skyrmion have already been implemented. Ferroelectrics, which have aligned electric dipoles without external electric fields, can stabilize topological defect structures to a smaller size using less energy; however, further research on ferroelectrics has not been carried out sufficiently. This is due to a lack of research on stabilizing topological defect structures and how to control them in an experimental setting. To overcome this problem, the team applied inhomogeneous deformations to ferroelectric nanostructures to successfully stabilize the topological defect structures. 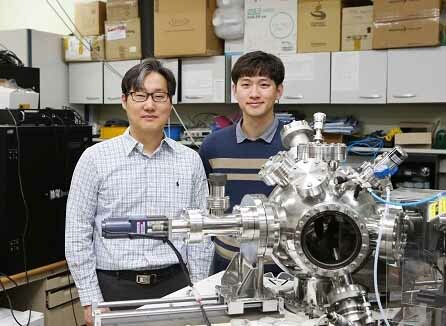 The team manufactured a ferroelectric nanoplate structure on a special board, which can exert strong compression from the bottom surface while the sides and the upper surfaces of the structure is free from deformation. This structure led to radial compressive strain relaxation, in which deformations of the lattice stabilize the vortex structure of ferroelectrics. This could lead to the establishment of the core principle of topological ferroelectric memory of high density, high efficiency, and high stability. This research, led by the PhD candidate Kwang-Eun Kim, was published in Nature Communications on January 26. The study was co-conducted by Professor Si-Young Choi and Dr. Tae Yeong Koo from POSTECH, Professor Long-Qing Chen from The Pennsylvania State University, and Professor Ramamoorthy Ramesh from the University of California at Berkeley.